Of course the dollar was doing the opposite, down hard overnight, but coming back up now, still below the 75 level. Bonds are down pretty hard, that is usually good for equities as money flows from bonds into more risky stocks. 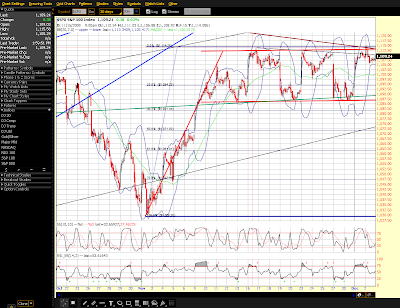 Oil is up some, but has made what appears to be a potential bearish flag, something worth watching. Gold set yet another record overnight touching $1,227 an ounce before falling back close to yesterday’s close. Obama just announced that he is calling in “experts” to a “jobs summit” he is holding. This is his attempt to find a way to jump start job creation! LOL, it is so ridiculous from my point of view. He’ll get a bunch of deficit spenders together to help determine how they can break the law to pump more debt backed money into the system. What they don’t realize is that they are poisoning the system with each attempt and with each injection. They are subverting the rule of law as well as fighting the laws of nature. Until they understand that the money they pump is backed by debt and that as the debt goes up, unemployment goes up, they will continue to fail, each failure coming on a larger scale than the last. Oh yeah, cash for appliances, that’ll save us. Speaking of employment, the Monster Employment Index fell one point to 119 from 120. Initial jobless claims fell 5,000 in the Nov. 28 week to 457,000, extending a run of impressive improvement that points squarely at improvement for total payrolls (prior week revised 4,000 lower). The four-week week average is lagging despite falling 14,250 in the week to 481,250. Continuing claims for the Nov. 21 week rose slightly to 5.465 million with the insured-workers unemployment rate steady at 4.1 percent, well down from a summer peak of 5.2 percent. The slight gain in continuing claims hardly puts a dent into 10 prior weeks of improvement, improvement reflecting new hiring but also, and likely to a large degree, the expiration of benefits. Those receiving extended benefits rose nearly 60,000 to just under 600,000 in data for the Nov. 14 week. Markets moved higher but only briefly in reaction to the report, one that will firm expectations for solid improvement in tomorrow's November employment report. Productivity and in the second quarter was revised down with the Labor Department's second estimate for the quarter. Third quarter productivity was revised to an annualized 8.1 percent surge from the initial estimate of a 9.5 percent boost. The market consensus had expected a revision to an 8.5 percent increase. Unit labor costs were revised up somewhat (less negative) to an annualized decline of 2.5 percent, compared to the original estimate of a 5.2 percent fall. The consensus estimate was for a 4.2 percent decline. The downward revision to productivity was primarily due to a downward revision to growth of third quarter output in the nonfarm business sector-to 2.9 percent annualized from the initial 4.0 percent. Unit labor costs were revised up based on the lower growth in output and higher compensation estimates. Compensation growth was revised up to an annualized 5.4 percent from the initial third quarter number of 3.8 percent growth. Hours worked were little revised. Year-on-year, productivity rose to up 4.0 percent in the third quarter from 1.9 percent in the second quarter. Year-ago unit labor costs fell to minus 1.4 percent from up 0.3 percent in the second quarter. Today's revisions indicated that labor costs are not as weak as previously believed but they are still subdued. The new numbers might have had a negative impact on equities, but the big news is the lower-than-expected jobless claims which boosted equity futures and bond yields. Yesterday’s action was unusual, the dollar rose while the market also rose. The undercurrents are shifting. Also, the RUT led the market, but there are still divergences with the rest of the market still failing to make new highs. The DOW is creating more of an expanding megaphone top. It, too, touched the upper boundary and fell back. So, we have competing patterns, one bullish, one bearish. EVERYONE is waiting for the break above 1,120, and that makes it either very dangerous or unlikely to break at all. So, for now the action is overall sideways, stuck in a range. Soon, the dollar and the indices are going to get squeezed, something’s going to give. 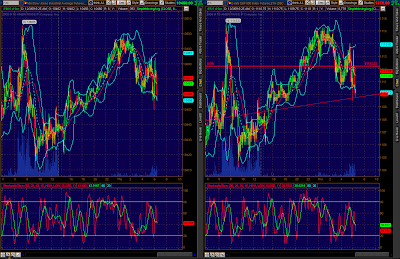 Still a ton of divergences, those WILL get resolved. As I’m getting this report out, the bond market is moving down hugely while the dollar is racing upwards… very unstable and a cross of directions. BE CAREFUL, I’m seeing smoke on the water, this is not normal activity.